Jack Mountain as seen from camp at Luna-Fury Col on an August 2006 trip to climb Mount Fury. Plume from Tripod Complex Fire in background. Jack Mountain as seen from Little Jack. When we got to the ridge crest below Little Jack the thought hit us that there wouldn’t be any running water or even snow on the ridge with which to hydrate ourselves. By 3:00PM (3 hours, 50 min total hike time) we were at the top of Little Jack looking for a stream or a snow patch. And lo and behold I spot one about the size of a kitchen sink on the east side of the ridge. (Later Paul would find one the size of a bathtub in the same general area.) Only problem was that the ice turned out to have some sort of miniscule larvae in it (mosquito larvae?) not too much larger than granules of sugar. Oh well, drink up anyway. The southeast view from Little Jack. We made camp at the little hump (6,600 ft) just northwest of Little Jack. We dubbed this little hump Little Jackie. The views from here are outstanding. Magnanimous (or maleficent?) 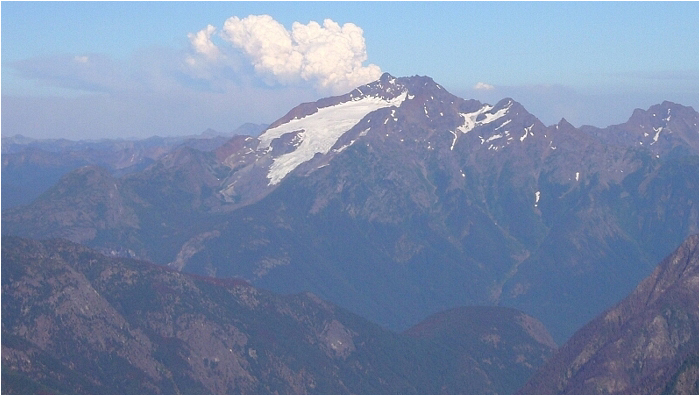 Jack Mountain stood aloof with its broad girth towering over the head of Crater Creek. We highly recommend going to Little Jack simply for the view. The fall colors on the nearby landscape were great too. Blueberries were also abundant, though overripe for the most part. Sunset from Little Jackie camp. L to R: Mt. Despair (7,292'), Mt. Baker (10,778'), and the Southern Pickets. When it got dark it was clear. Paul happened to see a shooting star zoom across the firmament and disappear out of sight almost directly behind the summit of Jack Mountain. A good omen? On the traverse over to South Face of Jack. We had left the tent at 7:10AM. By 7:30AM we were at the 6,080+ ft notch between Little Jack’s ridge and the hulk of Jack Mountain. By 8:30AM we were at the 5,600 ft low-point of our traverse over to the South Face of Jack Mountain. This low point is at the toe of the first major buttress west of the prominent waterfalls. Now, because Paul had been in the area before (both on the Little Jack side and on the Jerry Lakes side), he had his own photos of the mountain with which to reconnoiter a route. He perceived a way to save time on the traverse by beginning an angling ascent at these waterfalls. The way would go up a grassy/heathery slope that would ultimately round the corner of the next buttress to the east. From this corner, the South Face would come in to view and be easily accessed (or at least approached). Remember: it was Paul's perception that a way existed. He had no way of proving it unless going there and succeeding with it. Paul's route in magenta, Sergio's route in red, and our return route in blue (zigzag route). Now, here is where it gets tricky. There was a lot of route finding taking place here, so this will be hard to describe. On approach to the low point of the traverse it is necessary to pass through some timber. If you stay close to the buttress rock you will come upon a brushy, trickling gully that eventually disappears into a brushy boscage below. Do not downclimb the gully but parallel it in the trees to the right for about 80 vertical feet. Why not downclimb the gully? Because it’s steep, wet, muddy, and mined with loose rocks. One of these rocks about the size of a 450 Chevy engine block began to roll toward me. My reflexes took over as I made like a grasshopper and sprung out of the way at just the last moment. That boulder would have crushed my skull. Phew, that was a close call! Once you’ve gone down about 80 ft, look across the gully to where the buttress wall turns a corner and begins to head back uphill in a northeasterly direction. There will be alder growing up almost to the buttress. Cross the moist gully (about 100 ft) and climb NE in the tight squeeze between buttress and alder. Keep going until you come to a semi-open area that provides views of the cataracts to your right (eastward) and a cliff to your left (northward). With the cliff to your north and the waterfalls to your east, you’ll think you’re at an impasse, but there is a way. Trust me. There is a way. Actually, there are three ways: Paul’s way, Sergio’s way, and the way we used to come back. Each of these will be described in turn. Note: Beckey says to keep traversing below the cliffs until below the South Face. What we saw was a hell of a lot of brush that way—ugly. Paul’s way: straight up the cliff. DO NOT GO THIS WAY! From a distance, it looks like 4th-class terrain. But when you get half way up you'll realize it’s mid-5th (complete with very down-sloping ledges) and you’ll now be stuck with no other option than to continue up. Note that this cliff is also hard to protect, so don’t even think about leading up it with a belay from below. From about ¾ of the way up the cliff Paul was able to traverse on a thin grassy ledge to get to safety. Meanwhile, I opted to take the gully to the left. Scramble up on loose scree to the top of the ridge. Go right and follow the ridge crest (stay on left side of crest when going becomes difficult) over to the obvious saddle at the end of the 5th class chimney mentioned earlier. From saddle, observe a large grassy down-sloping ledge (some trees) breaking the cliff band in front and below you (the cliff Paul went up). Continue across the saddle and over smaller down-sloping grass ledges towards a rock face and small gully leading down to trees at the end of a large grassy ledge. downclimb a loose and exposed down-sloping 4th class face (right of gully when facing down) to aforementioned ledge. Traverse ledge while brachiating branches for dear life—just inches from the exposed cliff edge—until ledge widens and opens to heather slopes by a stream crossing. Stop at stream and take a few shots of whiskey to calm your nerves after this harrowing experience! The 3rd way (the zigzag): This is the way we came down but it can be done on the way up (see sketch). Between the cliff and the nearest watercourse canyon (the most westerly waterfall) there is a ramp/ledge system with scrub evergreens at various positions along it. From the semi-open area, bear northeastward obliquely uphill toward where the cliff abuts the shallow canyon. Find a sandy ramp that turns into a ledge. This ramp/ledge will pass through a short, evergreen squeeze tunnel and then terminate on the other side about 50 ft farther along. At the terminus, make an eight-foot step up (class 4) to another ledge that goes back left (west) about 50 feet to above the aforementioned tunnel. Make another step up (easier) to the next ledge up that goes back right 60 ft or so. This ledge makes a jog upward at its east end (class 4) and more or less ends just beyond a scrub evergreen. Use the evergreen to green-belay yourself up to a short, grassy face (class 3 or 4) then bear right to a large evergreen patch. Footing here is hidden underneath but the evergreens should hold you snug to the rock. Keep going straight up from one evergreen patch to the next. Above this second patch there is an easy scree ledge that crosses the watercourse just above the canyon. From here, it’s easy all the way to the South Face. Note: it may be advisable to do a running belay up this zigzag. There are ample trees to girth-hitch runners to but rope drag could be a problem. A 30m rope should suffice. Several streams come down from on high beyond the aforementioned difficulties. These streams are a good water source. Continue up the grassy slope past slabs and a minor rock band to where the slope rounds the corner of the next most easterly buttress. From this corner, the South Face below the main summit appears. Approach the snowfield(s) below the South Face and look for the most prudent way up the 50-100 ft cliff that bars easy access from snowfield to upper gullies. There are ledges on the far right side close to the Southeast Ridge that look feasible. Above these ledges, you could access the broad gully that leads up to the ridge crest directly east of the summit tower. This is not the way we went. Instead we angled up and left toward the large upper snowfield. We opted to go straight up the middle of the snowfield at its thinnest point (about 40 vertical feet). We put crampons on for this. At the top of this thinnest point a prominent ledge extended up to the left for several hundred yards. It was alternately sandy and slabby but easy. This broad ledge ends short of the upper snowfield (the snowfield above the west end of the lower snowfield). The terminus of the ledge coincides with a big block (a fallen merlon?) that rests half on the ledge and half on the cliff to the right. We then freeclimbed the cliff (low class 5) for about 20 feet to get to the less-steep gully above. (I say “less-steep” but the gully is still steep. In fact, from here on out, the gullies above are about as steep as they can get and still be climbed without ropes.) Note that this short cliff may be difficult to get back down because there are no places to make a rappel anchor. There is a way to get down without ropes but it requires a low 5th class downclimb of about eight feet. We essentially alternated between climbing in gullies or on small ribs all the way to the top. Parts of the gullies and ribs were clean and other parts were chossy. All in all, due to the chossiness and lack of protection points, none of it was conducive to belayed travel. On the way up, you’ll near a row of pinnacles up and to the right that look like ridge gendarmes. Keep left of these pinnacles. Left and just above the pinnacles there is a gully comprised of bright red rock. Ascend this gully or the rib to its left (possible snow whales at its top). From here you’ll be able to see the summit tower above and to the right perhaps 300 vertical feet up. Via loose ledges, slopes, and gullies, bear toward the notch just west of the summit blocks. At the notch, the easiest way is to go around the left (north) side of the ridge crest to a small slab (easy but exposed). From here the adrenalin will kick in and whisk you up to the summit (class 3). The view south. L to R (on horizon): Mount Logan, Mount Buckner, Glacier Peak (behind cloud), Boston Glacier, Boston Peak and Forbidden Peak. The final bit of scrambling to the summit with Jack's Southwest Peak (8,905 ft) behind me. A large tarn (unnamed lake at head of Devil's Creek) and Crater Mountain's East Peak (7,555 ft) as seen from near the summit. Peaks in mid-ground are, left to right, Azurite Peak (8,400+ ft), Tower Mountain (8,444 ft), and Golden Horn (8,366 ft). Peaks in the background are, left to right, North Gardner Mountain (8,956 ft), Silver Star Mountain (8,876 ft), Big Snagtooth (8,350 ft), Abernathy Peak (8,321 ft), and Big Kangaroo (8,280+ ft). The view NNW toward Ross Lake. Desolation Peak and Hozomeen Mountain are on the right. Looking over Jack's Nohokomeen Glacier at the North Cascades w/ Big Beaver Valley just right of center. L to R: Ruby Mountain (mid-ground left), Snowfield Peak, Colonial Peak, Paul Bunyan's Stump, Pyramid Peak, and Big Devil Peak (in far background). We made it to the summit from Little Jackie in 6.5 hours. Beckey says 6 hours but we lost about half-an-hour route finding back at the 5,900 ft level. We didn’t stay at the summit too long (perhaps 10 minutes). We snapped off our obligatory pictures and signed the register. Noteworthy names such as The Jung Climbing Machine (Jim, Roger, and David), Jan Deveny, Ronnie Parker, Mark Iffrig, Eric Hoffman, and Tom Sjolseth stood out in the register. We backtracked our up-route all the way down to the cliff band above the snowfield. The cliff band was dispatched by downclimbing it at a point about 40ft to skiers left of the fallen merlon (in a small depression in the cliff). This was the eight-foot 5th class section alluded to earlier. Paul saw this depression on the ascent but it didn’t look feasible as a way up the cliff. It was about while we were here that the first cloud enveloped the summit. Now that’s cutting it close: one hour to spare! Within an hour we were back at the zigzag. We didn’t know yet if it was a way to get back down but it seemed like our best option. If worst came to worst, we would rappel it with our 30m rope. But a rappel was not necessary, which is not to say it wasn’t frightfully exposed. Going through the evergreen tunnel was fun (like spelunking). On the other side of the tunnel we were home free, as if the tunnel led to a different world—a safer world. An hour-an-a-half later we would be approaching camp slogging on autopilot and sputtering on fumes. 12 hours and 15 minutes round trip. Day 3 (Sunday): We slept in. While the wind blew, Paul snored and I apparently mumbled in my sleep. Paul thought he heard voices outside at around 9:00AM, but I don't believe him. We awoke to light snowfall. The red and green landscape had added a thin dusting of white. It was socked in for the most part but the intermittent sucker-holes enlivened us. Eventually, we broke camp (leaving at 1:00PM). By 4:20PM we were back at the car, but not before revisiting the dead horse one more time. Ugh! What a foul smell! Ah, but who cares? We just climbed JSM—Jack’s Spanker Mountain. Yep, on the last gasp of summer, we spanked the spanker. Despite the damp, foggy weather, Paul is actually enjoying himself in the vibrant autumnal landscape. 1. While the approach for the Little Jack camp is shorter than for the Jerry Lakes camp by as much as a half, the summit day is twice as long due to the traverse one needs to do to get over to the mountain. All in all, they’re both about the same in terms of time spent on foot. 2. The Jerry Lakes basin and surrounding basins are beautiful, but Little Jack provides better distant views (all the way from Golden Horn to Snowfield Peak to Hozomeen Mountain) and almost as much nearfield scenery. 3. The traverse to Jack from the Little Jack side requires climbers with more stamina and those who are not faint of heart. The principle difficulty may be down low getting past the zigzag area, not the South Face. One could avoid the zigzag area by continuing eastward at the 5,600 ft level to below the South Face directly below the summit but this would entail much contouring on alternately brushy, forested, and cliffy terrain. It just did not look like it was feasible to us. 4. The more people in your party, the greater the risk of injury due to rockfall. It is darn near impossible to not kick rocks down the mountain. A party of two would be best. A party of four or more might do well to split into two groups and go down different gullies. 5. The snowfield(s) below the South Face are steep enough to warrant crampons in late season. Others have apparently avoided the snowfield(s) altogether by climbing in the moat behind the snow on the far right side. This would require an ascent of the rightmost gully on the face. However, this gully is probably the easiest of them all. Yet, this gully leads to the east side of the summit tower whose completion is one class 4 pitch. Some parties have elected to skirt below the south side of the summit tower to get to the class 3 west finish. 6. Water could be scarce on Little Jack in September. Look for ice patches on the east side of the ridge—especially on north side of Little Jack. When Paul was there in early September in 1997 there were still pools on the ridge but these were all completely dry for our trip. It is advisable to bring a water storage bag. Fill the bag up with ice when you get in to camp and by the time you get back from the climb it will have melted for you. We managed 2+ liters of water doing this.